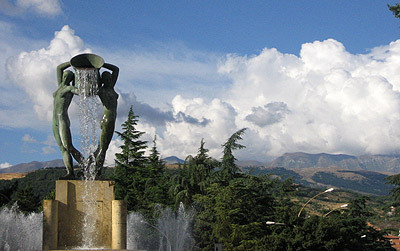 L’Aquila is a City of Abruzzo as well as being the main Provincial and Regional town. It was built up at the foot of the Gran Sasso (Big Rock) at a height (714) which dominated the valley of the Aterno. The City, already conceived by Federico II of Svevia, was constructed in 1254 on the remains of the previous Roman site of Amiternum. Revived in 1266 as a free Council after its destruction, can be attributed to King Manfredi (1259); containing 99 squares, 99 fountains and 99 “Castles,” each one electing its own mayor. It has a Union of mayors who constituted the “camera” citadina, (citizen room) with a camerlengo (Treasurer of the Papal Court) at its head. Thanks to the political and administrative autonomy, its economic and territorial development was rapid. L’Aquila minted its own currency, a true privilege of the medieval era, and also gave impetus to some specific activities; that of the silk, wool and lace industries, as well as the cultivation of Saffron, which allowed it to assume a role, second to that of Naples, as the most important centre of the Angioino reign. On 2nd June 1424, the City victoriously resisted an attack by Braccio da Montone, but was then overthrown by the militia of Giovanna led by Giacomo Caldora; it supported the house of d’Angio against Alfonso d’Aragona, and in the second half of the 1400’s, reached the height of its power.